– person in Jimma, Ethiopia. A new tool gives a powerful way to examine food prices around the world and in regional markets. Such a tool is timely: Rising food prices have again been in the news. The FAO food price index, which hovered around 224 in 2008 when food riots dominated media headlines, is currently at 232. 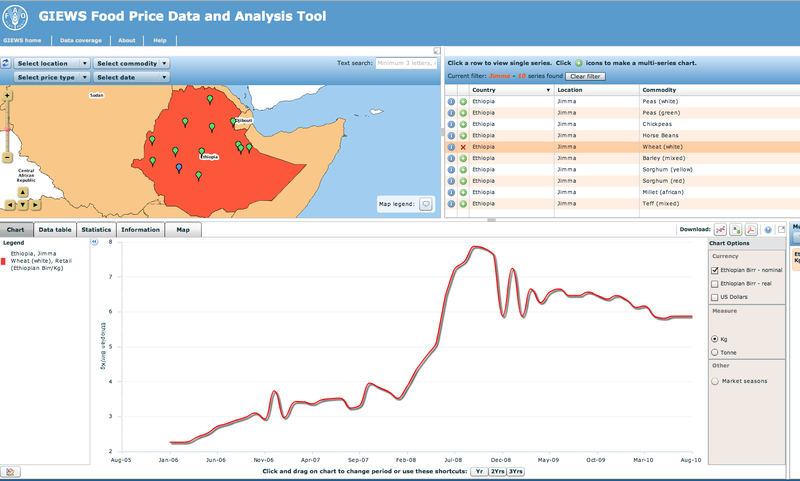 The Global information and Early Warning System (GIEWS) Food Price Tool is an easy to use online resource that allows one to track the prices of many different food across the world. I can imagine this would be useful for research and for teaching. For instance, students could explore the food crisis’ impact at specific sites, assess global variation in price fluctuations, track the transmission of global prices to regional markets, compare price differences in net food importing/food exporting countries, and assess variation within countries in market prices. 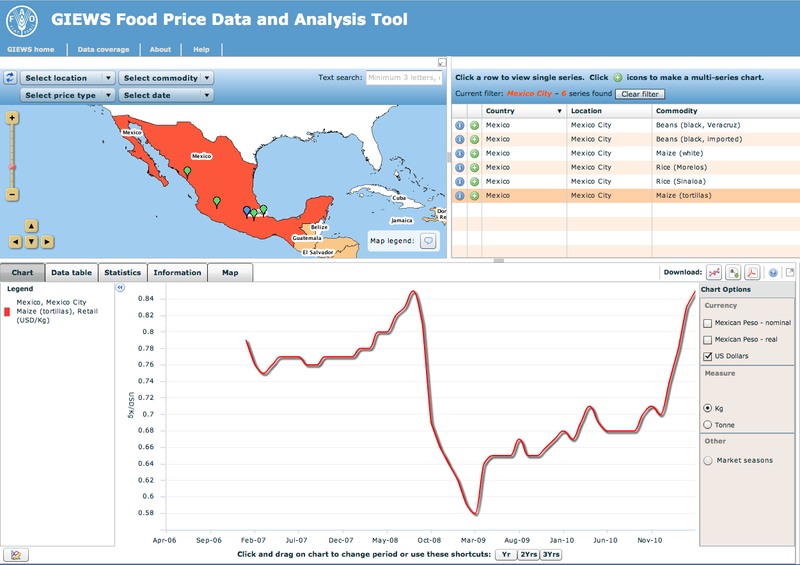 You can find the GIEWS Food Price Tool here. Once at the site you’ll see a map with all of the sites where food price tracking is available. You’ll also find international pricing as well. Clicking on the site of interest will bring you to a national level map and the various sites of data collection. Let’s look at Jimma, Ethiopia. Clicking on this site reveals that there are 10 food price series available including wheat, sorhgum, millet, and teff. Teff is an important component of the Ethiopian diet as is sorghum. Clicking on the teff option produces a time series figure of teff prices over the last three years. Two features immediately jump out from the figure. First is the rising prices beginning in late 2007 and peaking around mid-2008. Second, we see the “stickiness” of food prices: prices reach a new high but only decline a small amount before leveling off. You can add multiple commodities to the figure to compare prices, which gives some sense of how different commodity prices shift. The price trend for chickpeas, which also play a major role in Ethiopian cuisine (indeed the Information tab tell us: “Pulses are a major staple food used in traditional dish (Wot). Also a significant export crop. Pulses accounted for 5% of the total dietary energy supply in 2003-05.”), also shows dramatic upward trends. Clearly, the informant whose statement opens this post knows what he’s talking about! Users can also point and click their way to comparing price trends between two or more countries or sites within countries. This gives some sense for how regional grain markets move together or don’t. For instance, comparing the price of maize in the largest cities in Ethiopia, Kenya, and Tanzania reveals similarities and differences; the price of maize shows a much more pronounced spike in Ethiopia than in the neighboring countries. Of course data are available for non-African countries as well. Wondering how the price of tortillas in Mexico is changing? Simply click on the map, navigate over to Mexico, find Mexico City and click tortillas. The result? A tortilla crisis. Prices were high, dropped precipitously, and then rebounded with vigor.